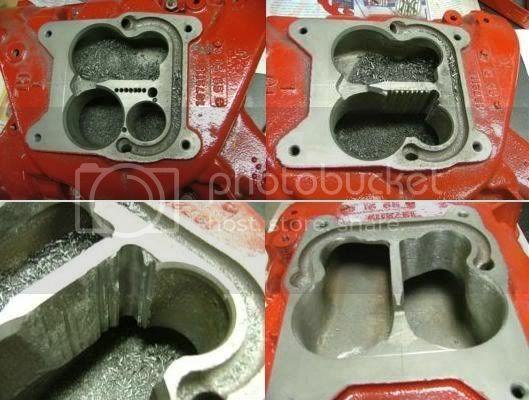 The advantages of porting out the intake is that it will reduce some of the restriction that the factory did. If you plan on starting with an NA set up then this is one of the best mods you can do and stay legal if you have to. The tools are fairly cheap if you look around but the bits are as expensive as the tools so do some shopping. It really sn't hard to do and you get a feeling for how to do the work once you start. You don't need to do the port match and you can cut the center out if you want to but you'll need to have someone weld up the big hole in the center where the EGR is so it won't cause an issue. I did the mod on my '66 401 Nailhead intake. Used a slightly different procedure. Maybe it'll work on the V6 to save some time..
After scribing my cutout, I drilled a row of holes inside the lines with a drill press. This insured the cutout would have nice sides that are plumb. Besides this intake is CAST IRON, so it's harder to cut than the aluminum! Then a jigsaw to 'connect the holes' and cut that portion out. Finally used the die grinder to remove a little more material and smooth things out. In theory, this mod will increase plenum volume and improve top-end performance. Oh yeah Walt, Looks good, '66 Nailhead Q-jet intake manifold getting hard to find anymore. now that I know your location, you should update your profile info... just so we can put a place to the name. now, you want a turbo... but your not quite sure what it takes to get there. OK, lets work with this. so you got yourself a nice, clean, low milage non turbo car. its a great start. we have a few options, lets take a look at them all to see where we go, I will try to be as realistic about total cost as possible. we throw some mods at the engine you have first. OK, we can get a better intake, a good set of headers, a better ignition curve and a solid carb. that should easily make a seat of the pants difference. I would say we could make all of these upgrades for under 700 dollars. parts needed: Intake, Carb, Gaskets, distributor curve kit, and TIME. we upgrade to a carb turbo system. now this is where it all begins to get kinda difficult. I will try to take it slow. OK, so first we need all of the parts to complete a carb turbo system (listed below) and we have to make the appropriate mods to the engine to make it stronger for the added power of the turbo. Now, most people are going to argue weather the pistons should be changed out in the motor to ones made just for turbo use, I myself prefer it but many have been very successful with the stock carburator pistons - you do some research and decide for yourself. here were looking at 1000 dollars to ensure correct and proper operation. Parts needed: [required] Intake, turbo assembly, turbo brackets, L/R exhaust manifolds, cross-over, up pipe, down pipe, boost refrenced carb, boost gauge, 5pin HEI distributor and ESC box (can be substituted for MSD BTM6) , and gaskets. Optional parts: turbo pistons, camshaft. Blow Thru Carb. This is the setup I like to call "BANG FOR YOUR BUCK" because this is probably the cheepest real fast system out there. Its relatively easy to set up and find parts for, but does require some tuning knowledge. this time around, you would get to use the intercooler like the 86/87 cars and probably make just as much power. Again, pistons, cam are things that are highly reccomended specially for the novice to boost tuning. I would honestly think this could all be easily done for 2000 bucks if your smart. Parts needed: [required] 4bbl intake, carb hat, boost reference fuel regulator, 86/87 L/R exhaust manifolds, crossover, down-pipe 86/87 turbo, either build or buy a blow through carb, 5pin HEI distributor and ESC box (can be substituted for MSD BTM6) , Boost gauge and gaskets. Optional parts: turbo pistons, camshaft, intercooler, alky kit. 86/87 GN SFI. This is the stock turbo system for the last of the GNs, while a great in operation system, it will require alot of work and time (did I forget money) to swap one of these systems. Parts..... well there almost too many to list, and so I wont. Your best bet is to find a car to swap the system out. its almost way to hard to piece it together otherwise, even for a seasoned vet. 1500+ + + + depending on how you choose to do the swap. does this kinda help any? Well from what you posted in the other thread it's a draw through set up. The bottom is good but you can use the top (heads on your car) and a different intake to do the up grade. Keep us posted please. Charlie, on my 401 intake the portion removed goes straight down from the scribed line to the plenum floor. Is it that way on the 4.1 intake, or are the walls sloped between the carb surface and the floor? I posted those 401 pics 'cause I thought you might be able to use that 'drill press' method to remove the chunk of material faster. Charlie, you start on those heads yet? can't wait to see that! I'll add: Regardless of what kind of induction system anyone wants to use, FUEL SYSTEM IS KEY!!!!! The fuel system has to meet the demands of the engine at any given rpm or boost level. With the drawthu system excluded, you must upgrade the fuel lines, fuel pickup in the tank, and add a return line. its just as important for us too.... mostly in volume though. keeping the bowls full fast enough can become a challange and sometimes the seats need to be upgraded to ensure enough volume. On the draw thru, upgrading to an Oddfire style of snout will allow you to use a GS 455 HV fuel pump. but be leary... it can over tax the front cam bearing. I have figured out how to make the HV switch onto the evenfire cam style snout.. but I have experianced cam bearing failures on this mod. I may try that on the next one but I used the sawzall to get rid of the biggest chenck. As far as porting cast iron it's easy if you have the right tools. :biggrin: I have a bit that will chew through it faster than a hot knife through melted butter. You"ll need to go to last months posts. I did start them but I've been fighting a sinus infection for the last month that just won't go away. That and the weather hasn't been good when I'm off so I end up staying in so I don't get sicker. Today is beautiful but I'm working on 2 cars and trying to cook a hind quarter and a shoulder so I haven't been on much today. This is the Christmas dinner for my co-workers and my friends. Yeah, I know a guy that does the mod with a sawzall and gets a nice clean cut exactly where he wants it. I was afraid the saw might wander off course and mess up my manifold, do I used the 'drill holes' method to play it safe. Having the right tools is everything!.... A milling machine would be perfect, but sometimes you have to improvise.